I love glitter. That's pretty obvious by now (hello...my new website is called Glitter Guide). However, my love for sequins and sparkles stops when it becomes tacky and over the top. I enjoy bedazzled jewelry on the wrist, glittery stilettos, a sparkly top with a pair of sleek slacks, a classic vintage sequin dress or a shiny blazer with a button up. This blazer was one of my favorite purchases last year. When I slip it on, no matter what I'm wearing, I feel happy and bright. It took my masculine outfit and gave it a little feminine pizazz. Your outfit is adorable, and you are right, the jacket makes it a happy outfit! Also I may have a slight obsession with your shoes. BEAUTIFUL!!! That silver blazer with blue shirt is very eye catching yet simple and elegant! GO GIRL! You look SO cute! I love that shimmery jacket. Lovely! Shimmer can go awry, but you've made it ladylike and sophisticated. 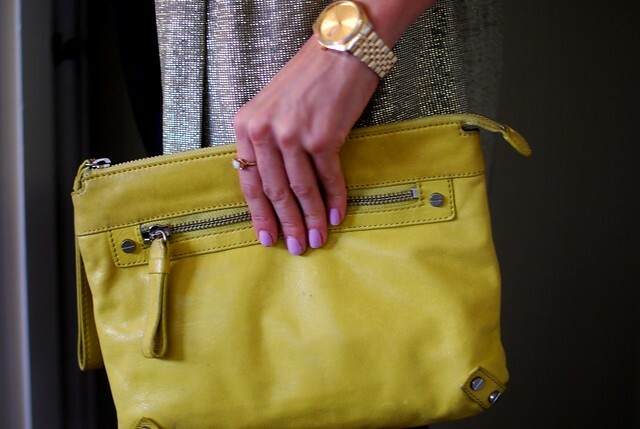 Adore the colors: from the pink lip, blue top, to the yellow clutch. So present, so chic. Btw, what lip color/nail color are you wearing in this post? Love the detail of your belt and bag. AND gorgeous jacket!! I love having items that you know will make you feel happy and confident : ] Great photos! That is one fun blazer. It looks really great, expecially with your pink nails. Love this, such a gorgeous blazer. although it look strange, the colour combination is pretty amazing and unique, love it! Oh that blazer is gorgeous. I too love glitter, but I always keep it classy and girly. okay you are so ridiculously cute! ohhhh I love the sparkly blazer! Beautiful! The belt is my fav! Its so cute. What a lovely, shimmery blazer! It goes so well with the simple blouse, and the playful leopard belt. I love the blazer with the thin leopard print belt. So adorable! You look so gorgeous in these photos!! And your skin... have you shared your skincare routine? it looks flawless! This would be the best work outfit! Sophisticated and chic! You look wonderful! Love the blazer! in love with the sparkle blazer!! you look gorgeous, taylor! and that blazer was definitely a find. it's a treasure i would keep in my closet forever. I love how you buttoned your shirt aaaalll the way up, but then threw on a sparkly blazer - perfect! I love this look, right down to the leopard belt and pink lips. I like how you've embraced all things glitter and sparkle without going overboard or too tacky. Great post!! I surprisingly love this look together. I think it's hard to pair a super shiny/glittery piece sometimes with flat colored pieces, but this looks great. Great blazer! Love the past pic of you! Sparkly blazer - how perfect! I love how you paired it with the button down, it's contrasting and unexpected. Love that blazer! It's so special and unexpected. And I love how you buttoned your shirt all the way up. I think it looks really preppy and cute. There are so many wonderful things about this post. The leopard print accent belt, the blue showing on the cuffs, the wonderfully sleek and elegant pony tail, and the setting is so natural and relaxed. Thank you! I love this, especially the belt! I love that you called it feminine pizazz! Such a great find, you will have / wear that blazer forever! ooo, i love how bright your blue shirt! i loooove your lip color...what is the brand/color? Awesome blazer! Love the leopard belt! I too love glitter and that blazer is to die for! Beautiful jacket. Love getting inspiration from your blog! I'm not usually a fan of blazers but I love this one. It's just too shiny not to like. looooooove the sequins. My mom even calls me her 'bling bling girl' :) I think you and I have similar taste! Love everything you wear. You look gorgeous as ever. You have such great style, very classy! I'm slowly embracing the completely buttoned shirt. Love the little addition of leopard! Such a unique and pretty blazer! Love this look! Oh I really love hte combination of the sparkles with the more conservative blue shirt. It's the perfect take on mixed up menswear. You still look so unequivocally girly, but I like the menswear shapes! Snazzy blazer!!! 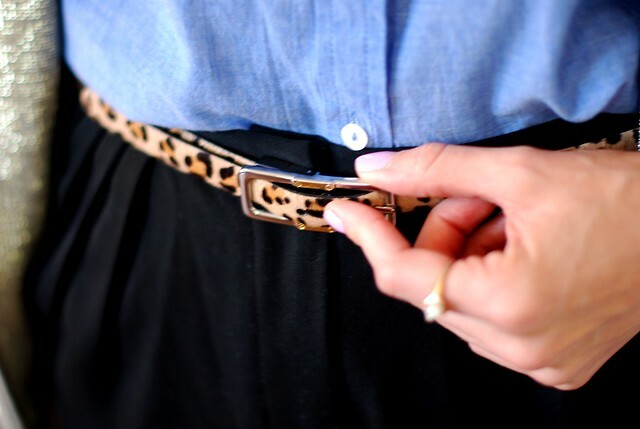 Love your blue button up and splash of leopard! Your glitter is totally refined- hard to do with the sparkle. Like the mix with the preppy shirt and leopard belt..... unexpected and delightful! I am so going to have to replicate this. Love how you put this together! I have the same shirt, need to get a sparkly/shimmery blazer to pair it with.